A [PDF version of this editorial ] appears in the October 14, 2016 issue of Executive Intelligence Review and is re-printed here with permission. That warning, that admonition, carries more pungency and more urgency today than on the day that it was uttered. As events unfold, with warnings of an impending financial crash coming from many different sides and numerous individuals, it is of utmost importance that all of us listen to the “wise words” of Lyndon LaRouche. In truth, none of the trans-Atlantic players on the field, even among the more insightful, have put forward proposals that indicate that they know what it is that must be done. Their minds are operating within layers of nested boxes, and their solutions are, at best, piecemeal; at worst, they are ludicrous. Our mission is to represent the highest standard and to fight—from the standpoint of history and as allies and friends of Lyndon LaRouche—for LaRouche’s policy. We should advocate and battle for nothing less. All you have to do is to take my laws, which I presented. Those laws, my laws, define exactly what solves the problem by creating a standard by which credit is defined. This was developed by the Treasurer of the United States [Alexander Hamilton]. This is the only way it will work . . . 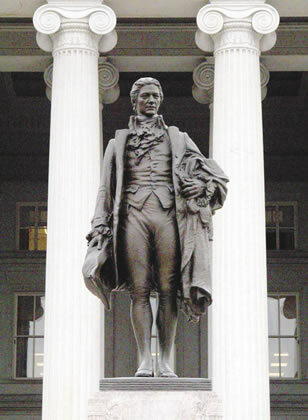 Statue of Alexander Hamilton in front of the U.S. Treasury Building. My national laws—those were whose laws? Not mine. I was the one who set up the standard for that, and they didn’t do much about it. Therefore, all you have to do is go for an international program based on that principle, the same principle, and you’ve got to get the people of the nations working together to understand what this kind of action is. Just read the publications on law by [Hamilton]. He wrote the laws. They’re written there. But people don’t do it. They talk about something else. Therefore, they don’t understand what makes history, what makes history work. What I did was actually a mechanism to define the way in which the original system had been established. By Hamilton. You don’t have to do anything else. That’s what you have to do . . .
You’re talking about Hamilton’s laws, and you’re talking about my laws. That’s what you’re talking about. Don’t change the subject . . . You have to get an international agreement among nations, among a significant number of nations, which will create a credit system, an international credit system or something tantamount to that, which will deal with this problem. We’re not talking about that, yet. You have to talk about that; you’ve got to talk about the work of Hamilton. You’ve got to put the name of Hamilton in there, and you’ve got to put my name in there. Because that’s the only way you’re going to get that thing done. Get some books about Hamilton’s economy. It’s all there. All I did was to put this thing into standards which conform to what Hamilton laid out. People have to take the handbooks, the records of Hamilton; read those things as Hamilton stipulates. Use that. Do it! Then you can go to the table and say, ‘Now we can create a credit system.’ Take Hamilton, and take what I have done. Put the two things together, and that work contains enough information to define exactly what has to be done. It’s just ignored because people want to be stupid. The danger in merely quoting from LaRouche is that what is presented is a one-sided argument in which LaRouche says “the following,” and, oftentimes, members respond by saying, “LaRouche says this, but I am going to do something else, because I know better.” Something more practical, more limited. And that sets a different agenda. The quotations here from LaRouche are not “his” policy. They must be the policy orientation of all of us in the LaRouche movement—LPAC, EIR, the Manhattan Project, and every member. We represent the leadership, under LaRouche’s direction, in this crisis. What we say, what we do is critical, and we must act accordingly. We are agents of history, not practical politicians. HELGA ZEPP-LAROUCHE:Global Financial Crash and Danger of War! Is It One Minute Past Midnight?